Don’t forget that our monthly club meeting on Dec. 20 will be our Christmas dinner held at Ryan’s Steak House (map) starting at 6:00 PM. We encourage everyone to attend and ask that you bring an unwrapped toy for a boy or girl (any age) to be presented to the Salvation Army for their Angel Tree program. This year, the Salvation Army Angel Tree is serving over 18,000 individuals for Christmas assistance including children up to age 12. 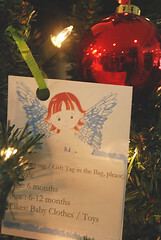 Help us fulfill a child’s dream of finding wonderful gifts under the tree on Christmas morning. The Nashville National Weather Service (NWS) (map) has confirmed their participation with this year’s SKYWARN Recognition Day. This 24-hour event will be held on Dec. 1 0000 – 2400 UTC, or from Nov. 30 6:00 PM CST until Dec. 1 6:00 PM CST. Mr. Vannozzi, Meteorologist-in-Charge of the Nashville NWS, has graciously agreed to lead tours at 10:00 AM, 2:00 PM and 4:00 PM. There will also be a meteorological balloon launch at 5:00 PM. A VHF/UHF station will also be available for anyone interested. All amateur stations are encouraged to exchange QSO information with as many National Weather Service Stations as possible; contacts via repeaters are also permitted. This day serves to celebrate amateur radio contributions to public safety during severe weather. More information can be found on the NWS SKYWARN Recognition Day page. Tony, KF4KFQ will be hosting the 9th annual Santa Net. This year, unless there is an emergency, the Net will be held on the MTEARS repeaters making it a state-wide event. We encourage everyone to check in and let those little hams get on the air to have a QSO with Santa! He is scheduled to transmit from North Pole One! More information is on our Santa Net page. It includes the MTEARS frequencies along with a list of information Santa needs to make the child’s QSO memorable. Starting in December HF night will be back on a new night. HF Night will be on the second Tuesday, December 11, 2012 from 7:00 PM to 9:00 PM. Anyone, no matter what you license grade, who would like to operate on HF should come out to Lock Two Park on the 2nd Tuesday of the month and give it a try. There will be Extra Class operators to help get you on the air. The officers of the Nashville Amateur Radio Club would like to wish everyone a safe and happy Thanksgiving. Have a safe trip if you’re traveling, go ahead and eat too much, and enjoy the day with your family and friends. As you’re thinking about what you have to be thankful for remember those who are less fortunate. Keep in mind that at our club Christmas dinner on December 20th at Ryan’s Steak House at 6:00 PM that we will be presenting the Salvation Army toys for children who did not get picked from their Angel Tree. Please bring unwrapped toys for girls and boys and help some needy children. Winter weather can be hazardous. The cold temperatures can cause hypothermia and frostbite that can be life threatening. Cathy KK4IWN would like everyone to be winter weather aware with a presentation she gave in the last club meeting. She has provided the presentation slides along with an American Red Cross Preparedness Guide to help everyone stay safe during the winter months. More information on preparing for severe weather can be found in their Gateway-to-Recovery Community Emergency Response Team (CERT) website for the Donelson-Hermitage area. On Monday, November 5, the FCC issued a letter dismissing a Petition for Rulemaking filed in February 2012 by Rolan Clark, W3FDK, of Adamstown, Maryland. In his Petition, Clark had asked the FCC to amend Section 97.219, specifying that control operators of the first forwarding station in a message forwarding system of stations should not be obligated to authenticate the identity of a station from which the message forwarding system accepts messages, and that the first forwarding station should not accept accountability for any violative content of the messages put into the system. Clark held that the control operator of all forwarding stations in a message forwarding system should have the same obligation as the control operator of a voice repeater that retransmits a message that violates the FCC rules. Clark specifically asked that the phrase “except as noted in paragraph (d) of this section, for stations participating in a message forwarding system” be removed from Section 97.219(c), and that Section 97.219(d) be removed completely. Section 97.219(d) currently provides that for those amateur stations that participate in message forwarding systems, the control operator of the first forwarding station must either authenticate the identity of the station from which it accepts communications on behalf of the system, or accept accountability for any violation of the Part 97 rules contained in messages that it retransmits to the system. Maintenance on today’s cars is vastly different than auto maintenance standards on cars of the past. You don’t need to change your oil every 3,000 miles. Air filters can often be cleaned instead of replaced. Want to save hundreds of dollars a year on automobile maintenance? Then stop over-maintaining your vehicle. Sales pitches by fast-and-furious oil change shops and service centers touting all sorts of fluid flushes and lube jobs have Americans wasting wads of cash on unnecessary service items — particularly on newer vehicles.